The dust suppression spray kit is equipped with a nozzle that can cover an 80-degree cone around the tool at 40 psi of pressure, dispensing 6 gal. of water per hour. 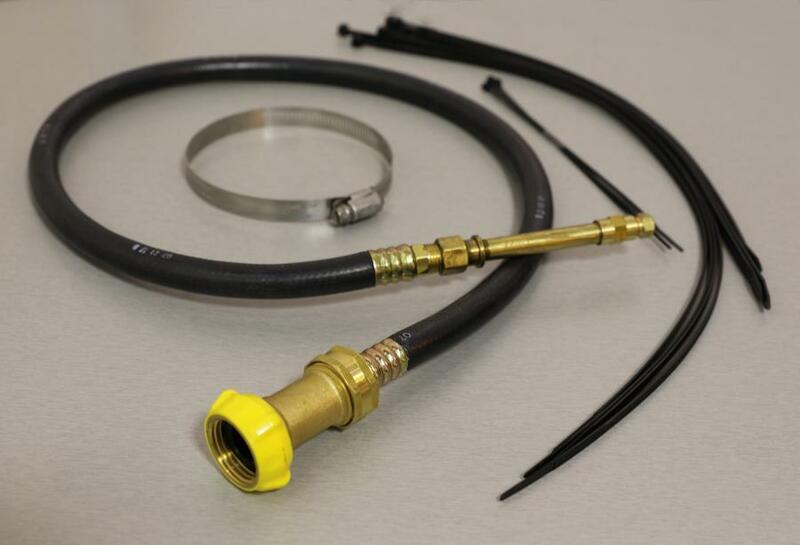 The kit connects to a garden hose, making it simple to utilize any water source on a job site. Atlas Copco Power Technique North America has introduced a 36-in. (91 cm) retrofit dust suppression spray kit for handheld tools. The kit can be attached to an Atlas Copco handheld breaker, rivet buster or chipping hammer and helps to comply with requirements of the Occupational Safety and Health Administration (OSHA) final silica rule. Use of the kit minimizes workers' exposure to harmful silica dust through a continuous spray of water at the point of impact, which flushes the dust before it becomes airborne. When used with Atlas Copco's handheld breakers, rivet busters and chipping hammers, the retrofit dust suppression spray kit complies with Table 1 of the OSHA engineering and work practice control methods. OSHA's crystalline silica rule went into effect in September 2017. “We're always looking to provide the most effective solution for our customers,” said Haile Tsegaw, product manager — handheld at Atlas Copco Power Technique North America. For more information, visit www.atlascopco.us.